Little Ones sleep bags combine quality, comfort and safety at a price you won’t find anywhere else! Babies and toddlers benefit from a better night’s sleep at a constant temperature, while parents can rest assured too in the knowledge their children are sleeping safely. 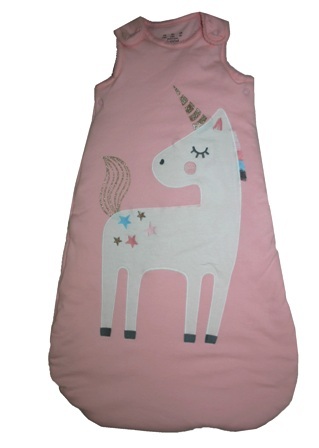 Little Ones sleep bags can be easily washed and dried and can be taken with the child for overnight stays. All sleeping bags are of exceptional quality and are exclusively designed for F & F Stores. Made with 100% cotton outer and 100% cotton inner they are all rigorously tested and can be both machine-washed and tumble-dried. The filling is made from quick dry soft polyester fleece, which helps to prevent allergies and stops the sleeping bag losing shape and becoming 'lumpy'. Research shows that when using conventional bedding babies tend to get too hot or too cold. Little Ones baby sleep bags ensure babies remain at a constant temperature and eliminate the need for any other top covers. Simply put your baby into his sleep sack when he is ready for bed and then pop him into a Moses basket or cot. Do not use any blankets or duvets. Staying within the sleep sack minimises disruption when feeding during the night, and being snug also means they are more likely to go back to sleep if they do wake up unexpectedly. Approx Weight 2.5 tog. These bags are padded and suitable for general year-round use in room temperatures between 15 and 21 degrees.